The great orator and politician George William Curtis once remarked, “It is not the ship so much as the skillful sailing that assures the prosperous voyage”. But then again, Mr. Curtis never built a boat. 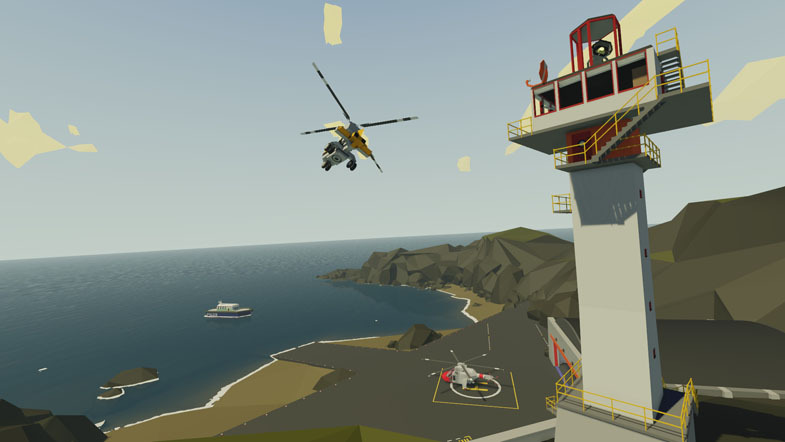 Stormworks: Build and Rescue is a recently-released Early Access sandbox building game. It’s the first title from developers Sunfire Studios and the most recent title published by Green Man Gaming. 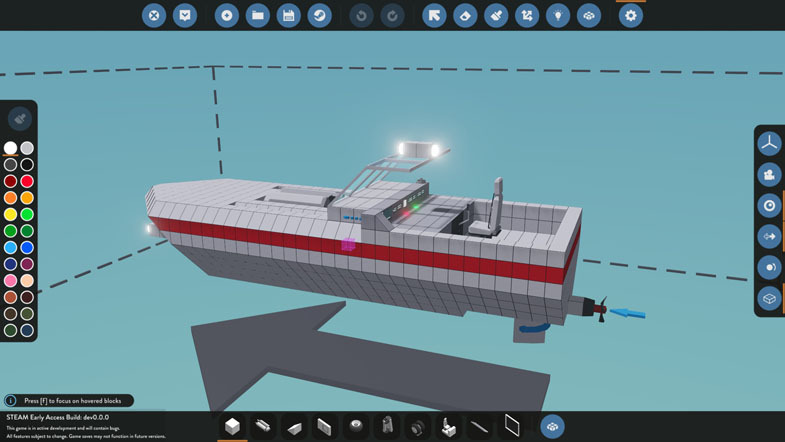 In Stormworks, you will be tasked with building vessels of the sea, land, and air to use to complete missions and earn money. The world of Stormworks presents as simple: Sparse voxel islands populate a vast sea, and your playable character is angular and faceless. The ships and helicopters that you are provided with are blocky creations with basic designs. But beneath this spartan presentation is a deceptively complex building system accessed at workbenches from inside your base. The drag-and-drop building mechanics are easy to learn, but the options available make Stormworks difficult to master. Nearly any shape is possible and the system used to map controls to rudders and engines includes basic logic gates, making complex calculations and controls a possibility. Building a working craft from scratch can be difficult because the physics engine is unforgiving, causing all but the most thought out creations to sink or flail around when piloted. When you can finally create a ship that’s seaworthy (or accept your failure and use the premade ship provided for you), you’ll be able to start missions. Though the objectives vary a bit, all of the missions are essentially fetch quests: move this person from here to here, move these boxes from there to there, etc. The challenge comes from the requirements of the object you’re fetching because some objects are too large to fit in the premade vessels, while people-moving requires extra seats on your ship or helicopter. Careful planning and skillful building will be a necessity, but just like in real life, sometimes the world can work against you. You’ve conquered Stormworks’ building mechanics. You’ve saved a few lives, delivered a few crates. All in a day’s work for an intrepid coastal delivery man. Now you can turn your attention towards the sea itself. Despite its vastness, the watery world of Stormworks doesn’t feel empty. Islands are far apart, but always present on the horizon, and the ambience provided by the excellent music and sound design keep you from feeling too alone. Still, Stormworks is loath to let you feel comfortable, as a storm can strike at any moment, tossing your vessel around with rough seas and harsh wind. Stormworks: Build and Rescue has everything you look for in a casual (but not too casual) title. It expands on well-worn mechanics to provide a familiar but deep experience. Building is interesting and can be as simple or complicated as you’d like, with the logic system providing a wealth of possibilities. Gameplay is straightforward while still being challenging. Its Early Access status allow you to contribute to the development and its developers, Sunfire Studios, have updated Stormworks nearly every day since release. This is a title well worth picking up as it stands, so its final iteration looks like it will be a truly great experience.